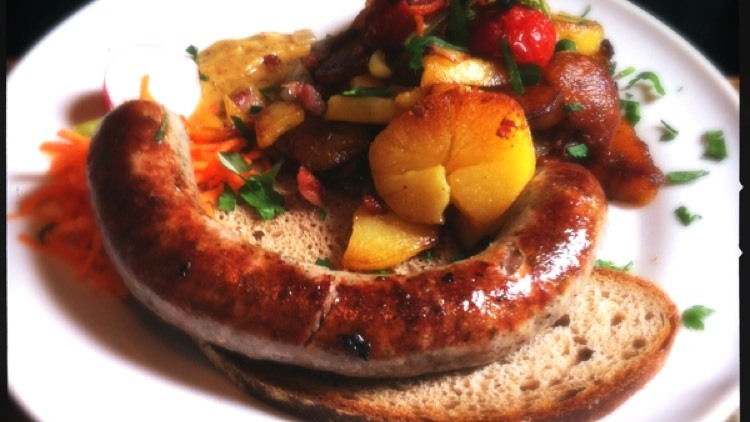 Having done extraordinarily well in the World Cup, we decided it was time for German food to be given a bit of profile in this month’s blog! The separate regions of the Germany like Bavaria, Saxony, and the Rhineland regions have all had an influence on today’s German cuisine – it’s also been influenced by the reunification of Germany in the 90’s, where Eastern European and Russian dishes had become popular since the end of the War. German dishes and old regional or classic recipes have experienced a resurgence in popularity in recent years but immigration last century has also influenced the German diet – Italians brought pizza and pasta, Turks brought kebabs and Middle Eastern dishes, and later Chinese, Greek, Indian, Vietnamese and Thai immigrants brought their cuisines. Meat – Germans are big meat eaters. Beef, poultry and especially pork are the main meats consumed and are usually pot-roasted but Sauerbraten (sour roast) involves marinating venison or beef in a wine vinegar mixture for several days. The Germans love sausages and there are over 1500 varieties available from a range of specialist sausage butchers around the country. Bratwurst (frying sausage) is the most popular. Other varieties include Wiener (smoked sausage),Blutwurst (blood sausage), Leberwurst (liver sausage) and Schwarzwurst (black sausage). Currywurst – a German/Indian fusion food – a sliced bratwurst served with spicy curry ketchup. Dumplings – another popular side dish – Klöße or Knödel, or Schupfnudeln are like Italian gnocchi. Spâtzle are German egg noodles and a popular side dish, especially in Bavaria. Maultaschen are similar to ravioli.